Wrightsville Beach, North Carolina is a welcome oasis on the Intracoastal Waterway. 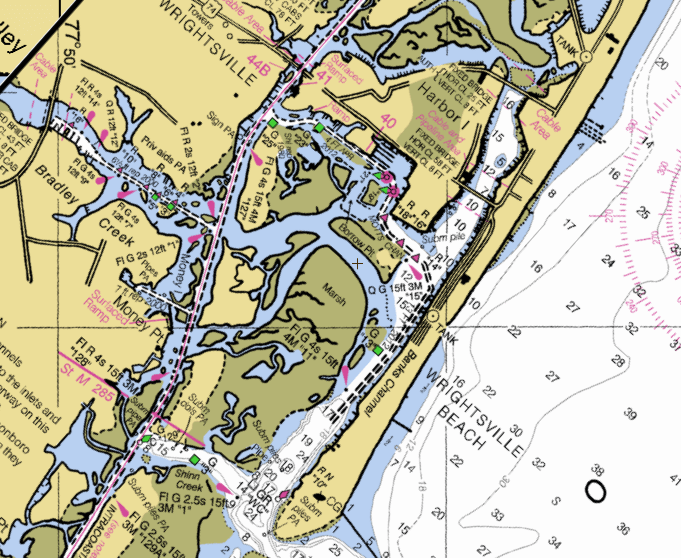 Masonboro Inlet provides a nearly all-weather cut to the ocean, though boats going south from or coming north to Wrightsville would be better, distance-wise, coming into the Cape Fear River, about twenty miles south. For us, taking the inside route from the north, Wrightsville Beach was the first town of consequence since Beaufort and Morehead City, North Carolina, or about the last eighty miles, two days, and a night full of no-see-ums. With good food, alcohol, a morning coffee shop, and easy provisioning all wrapped in a beach town, we felt like we had found paradise, at least for a day or two. Coming into Wrightsville from the north, we first had to go under the Wrightsville Beach Bridge, which only opens on the hour 7am-7pm. Though we did circle for a bit in the strong current north of the bridge, we were lucky to have a tug and barge come along as the bridge opens on request for commercial traffic. Saved from another half hour of puttering, we swept through on the current just in front of the big barge. South of the bridge, our draft prevented us from taking Motts Cut over to the anchorage. Instead, we proceeded south to just before ICW green marker “129” and took a left into Shinn Creek. This brought us into Banks Channel and against the current up to the anchorage. Being a Saturday afternoon in late August, literally hundreds of boats passed us on all sides the entire time. Finally reaching the anchorage just south of the fixed bridge, we quickly found a spot in about fifteen feet of water and dropped the hook. There were two or three permanently moored boats, three long-term transients, and a couple other boats that were just there for the night, but there was still plenty of room for more. However, the anchorage looks more protected on the chart than it actually is. The current flowed in and out, easily turning our boat on every tide change despite a steady 15-20 knot northerly breeze that blew through the anchorage almost unblocked by the houses and bridge to the north for the three nights we were there. But the holding was good, and, in our heavy Tayana, were never rocked seriously by the constant wake from the steady stream of boats that went by during daylight hours. What the anchorage lacked in protection, it made up for in proximity to amenities. After having a beer in the cockpit to make certain the anchor was well set and we were swinging fine, we got the dinghy in the water and headed over to the town dinghy dock, which is just south of the fixed bridge. On the way, we stopped and chatted with a couple on one of the boats in the anchorage. 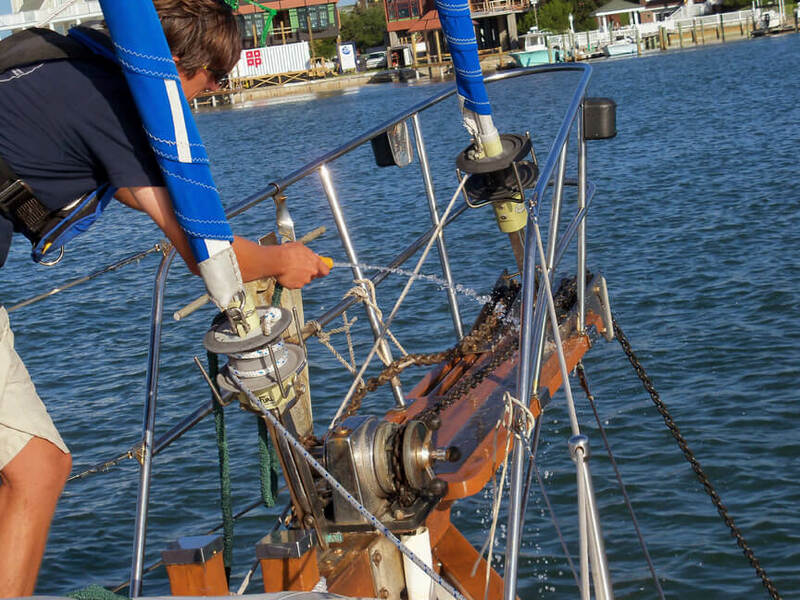 It turned out they had been spending the summer in Wrightsville after having completed a circumnavigation. They oriented us to the area and, over the next few days, kept an eye on our boat and answered all our questions. After heading in and tying up at the dinghy dock, we made a beeline for Tower 7, a Mexican restaurant that you can see from the anchorage and that is highly recommended by a few people on ActiveCaptain. Crowded with folks in flip-flops and bathing suits, it was a causal beach town restaurant with a nice bar, which we promptly bellied up to. The beer and alcohol selection was fairly good and the food was outstanding, exactly what we were craving. We would be back to Tower 7 every morning for coffee and breakfast, but after we finished our burritos and fajitas, we walked the main street, checking out a couple of the bars in the now pouring rain. The other establishments offered nothing special, though it seemed clear we were about five hours early for the real excitement. Instead of waiting until then, we grabbed a twelve pack of Sierra Nevada at Robert’s Market, a moderately stocked grocery store right on the main street, and headed back to Bear where we were asleep long before the shoreside bars filled up. Tim was flying out of Wrightsville Beach on Monday, so we had all day Sunday to explore. After breakfast, we walked across the fixed bridge, along with countless joggers, bikers, and walkers. Not finding much beyond houses, a few stores, and a Baptist church handing out bottled water, we returned to the dinghy and headed over to the Bridgetender Marina, just south of the bridge on the ICW that we had passed under the day before. The Bridgetender Marina kindly offers free dinghy docking. From there we walked about a half mile to West Marine and a huge Harris Teeter supermarket, passing a handful of restaurants and other stores along the way. The rest of the day and into the next morning, we explored the island, walking the beach and locating – a little too late – a couple cool bars ten blocks north of Tower 7 on Salisbury Street, between the other bridge onto the island and the pier on the ocean. 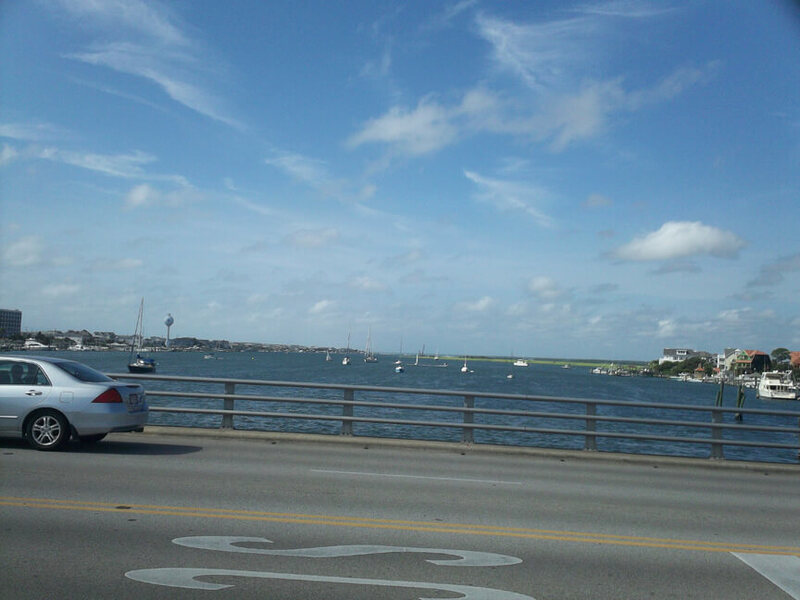 By the time we were waiting for Enterprise to pick us up at the dinghy dock – so I could take Tim to the airport, run errands, and then pick up my Dad the following day – it seemed like we had seen all that Wrightsville had to offer. And it had most everything a cruiser could want in a comfortable beach town, making it a great stop for a day or two. Any longer, though, and I am sure I would have gotten stir crazy. Of course, the city of Wilmington is just five miles away. And if we come in for more than a couple days in the future, we will definitely rent a car and explore Wilmington while staying in comfortable Wrightsville Beach.